Sicily is an incredibly beautiful island off the coast of Italy. It’s situated in the central Mediterranean Sea and is the Med’s largest island. Arguably most famous for being the home of one of the most active volcanoes in the world, Mount Etna, Sicily is also graced with fabulous beaches, quaint towns, attractive scenery, history and culture and mouthwatering cuisine. When you visit Sicily today it’s hard to imagine the area in ancient times but there has actually been a human presence on the island since around 12,000 BC. The island has had an interesting history since then; it has come under the rule of several different nations and empires, including the Vandals, the Ostrogoths and the Byzantine Empire. It wasn’t until 1860 that Sicily became part of Italy and it was given its status as an autonomous region of the country in 1946. Visit Sicily and you can’t fail to be impressed by its array of architecture and historic sites. It’s a place with a long cultural history in art, literature, music and cuisine. You can become truly immersed in this culture as you walk the streets and dine in the restaurants of this beautiful island. Sicily is not just about the culture though; it’s an incredibly beautiful place to visit. You can’t fail to see the giant presence of a smoking Mount Etna which is truly awe inspiring. It dominates the region and is accompanied by the crystal blue waters of the sea and the stunning mountain scenery. 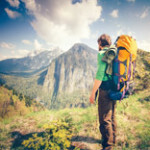 Once you have sat back and admired the view for a while you’ll probably want to participate in some of the many activities on offer, including hiking, swimming, diving and climbing. One of the great things about visiting Sicily is that you can be as laid back or as adventurous as you choose to be, as this island has something for all activity levels. No visit to the island of Sicily would be complete without a trip to the markets in the capital, Palermo. You can take the opportunity to sample the incredible tastes of Sicilian food while you’re there. The flavors of Sicily are ones that you’ll remember long after your trip is over. They are very high on citrus as the island is well known for its array of lemon trees, and, as you might expect, the island’s food also includes fish such as tuna, as well as a variety of nuts and wild herbs. It’s an intoxicating and tasty mixture for the tastebuds. Once you’ve enjoyed a stroll around the markets of Palermo, and taken in some refreshment, you can admire the architecture of the city, which reflects its varied history. You can see the multi-colored mosaics from Byzantine times as well as Baroque decoration and Arab domes. 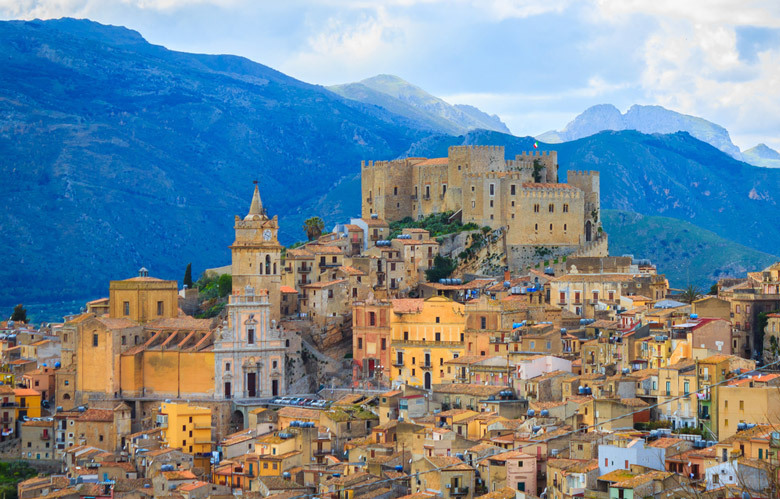 It’s a jigsaw of styles that fits together to create the magnificent Sicilian capital and just one of the things you should do when you visit Sicily. You’re never going to be short of things to do in Sicily. This incredibly beautiful island is filled with eye catching scenery and has a fascinating history. 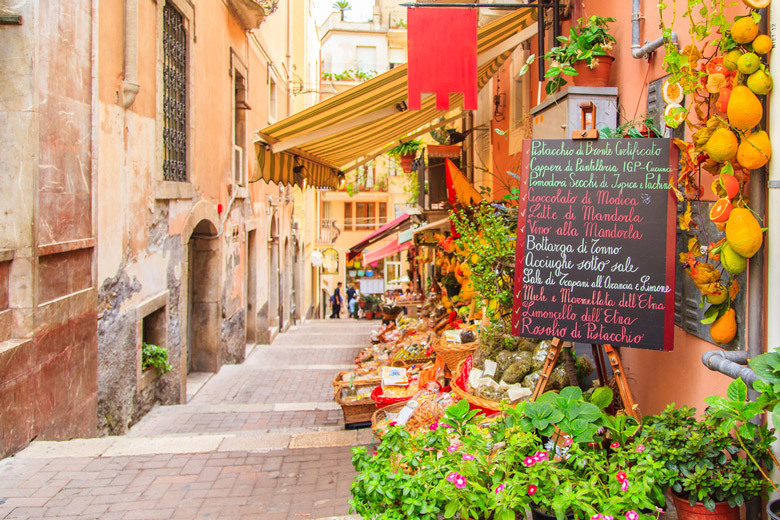 Spend time relaxing on the beach, admire the historic architecture or climb amidst volcanoes, and after a day of exploring, relish the tasty Sicilian cuisine. If you’re looking for ideas about what to do, here’s our list of the top ten Sicily attractions.